In our series Saving Southern Recipes, we explore the deep heritage of Southern cooking through the lens of passed-down family recipes. 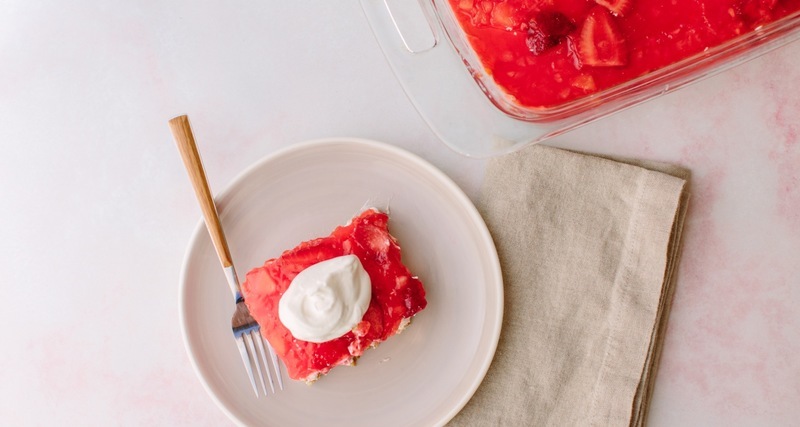 In the canon of congealed fruit salads, the strawberry pretzel salad takes the cake (or um, pie). This is my official assessment and I’m sticking to it. The history of Southern meals is centered around this idea of a meat and two sides. From what I have experienced and learned, this perfectly portioned plate was also accompanied by a small salad and oftentimes, a dessert. Salads weren’t always made to be an entree; in fact, in the South, they were never bigger than what a small crystal bowl could hold. My mother describes her childhood supper salads as consisting of iceberg lettuce, vegetables and a small amount of mayonnaise/dressing or a perfectly cut square of a Jell-O salad. In 2018, surrounded by full plates of lettuce, it is hard for us to image that congealed sugar and flavoring could ever be considered as a salad. However, these dishes continue to be a mainstay of holiday meals, barbecues, showers and potlucks alike. We have the Jell-O corporation to personally thank for decades of congealed and molded fruits and sometimes vegetables. 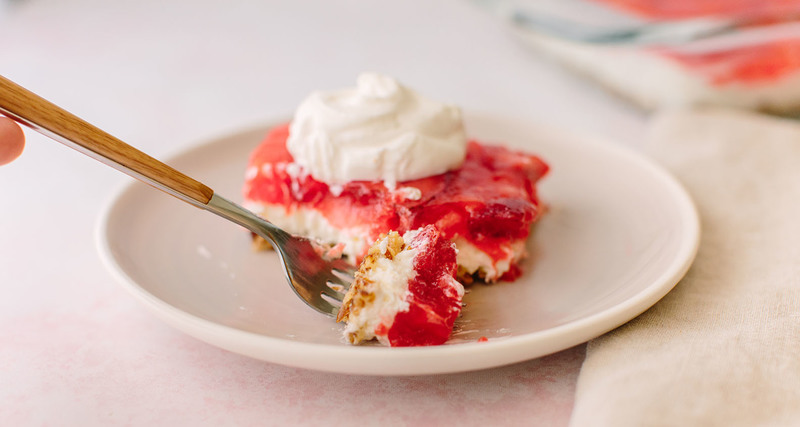 With its many different variations, the strawberry pretzel salad seems to be amongst the most popular. The recipe is believed to have originated in the 1960s when the Joys of Jell-O cookbook was published. In a second medium bowl, stir together the pretzels and butter. Press firmly into the bottom of a 9- by 13-inch baking dish. Bake until lightly browned and set, about 15 minutes. Let cool completely. While the crust bakes and cools, stir together the sliced strawberries and 1 cup of the sugar in a medium bowl. Cover with plastic wrap and let sit until the strawberries have given off their juices, about 45 minutes. In a large bowl, use an electric mixer to beat together the cream cheese and remaining cup of sugar until smooth. Fold in the Cool Whip. Spread across the cooled crust. Drain the pineapple and the strawberries, reserving all of the juices. Pour the juices into a 2-cup measuring cup and add enough water to reach 2 cups. Transfer to a small saucepan and bring to a boil over high heat. Immediately remove from the heat and whisk in the strawberry Jell-O. Let cool until almost set. Stir in the pineapple and strawberries and pour over the cream cheese layer. Cover and refrigerate until set. Serve topped with a dollop of Cool Whip. Do you have a beloved family recipe to share? We'd love to try it. If it's written on a recipe card, even better. Send a picture of the recipe card or a typed-out version of the recipe to editor@southernkitchen.com. If you can, please include any stories or memories you have about the dish — these will help make your recipe shine! Our goal is to build out a robust visual database of Southern recipe cards to share with you, our community.